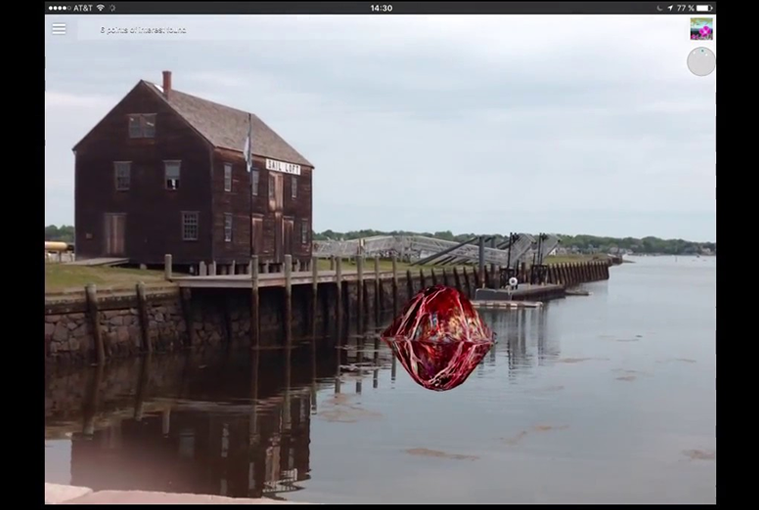 Commissioned by Boston Cyberarts, four internationally acclaimed artists – John Craig Freeman, Kristin Lucas, Will Pappenheimer and Tamiko Thiel – have created eight Augmented Reality (AR) sculptures for The Augmented Landscape, an open-air public art installation at the National Park Service’s Salem Maritime National Historic Site, on view now through November 30. Inspired by Salem’s unique history and ecology and located on the city’s historic waterfront, the geo-located artworks delve into issues as diverse as East-West relations, New England’s maritime connections with Russia, Japan & China, American idealism, the discord between globalism and isolationism, piracy as warfare, as well as the effects of climate change, global warming and rising waters. Augmented Reality (AR) is computer-generated sound, video, or graphics that are layered into a real-world environment. 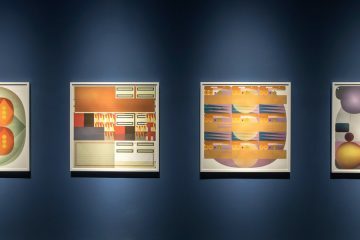 The National Park Service has printed maps available for visitors that include the site of each piece, an image, artists’ information, title of the work and how to download the augmented reality Layar app (free for iOS and Android) to view the work. The information is also available online, at the Boston Cyberarts and NPS websites. John Craig Freeman’s Virtual Russia and Virtual China use the historic Salem Custom House as a metaphoric portal, transporting users to two alternate realities in the cities of Wuhan, China and Saint Petersburg, Russia. 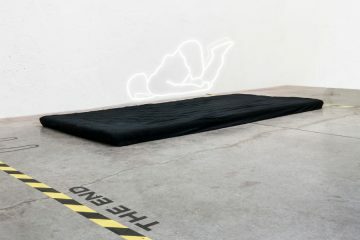 The project evokes the history and contemporary manifestations of globalization, international trade, and revolution. In Kristin Lucas’s Elephant in Room, an elephant brought to America as cargo lounges in a psychiatrist’s chair reminiscing about its natural habitat–an idiomatic twist on the phrases “elephant in the room” and “elephants never forget.” In Goodbyes, Lucas creates a collection of 3D models sourced via online markets, and crafted by others for “goodbye” occasions. Will Pappenheimer’s Ascension of Cod creates a school of virtual cod swimming upwards towards heaven; and Privateers Reenactment re-envisions the Revolutionary War form of congressionally chartered private naval action. 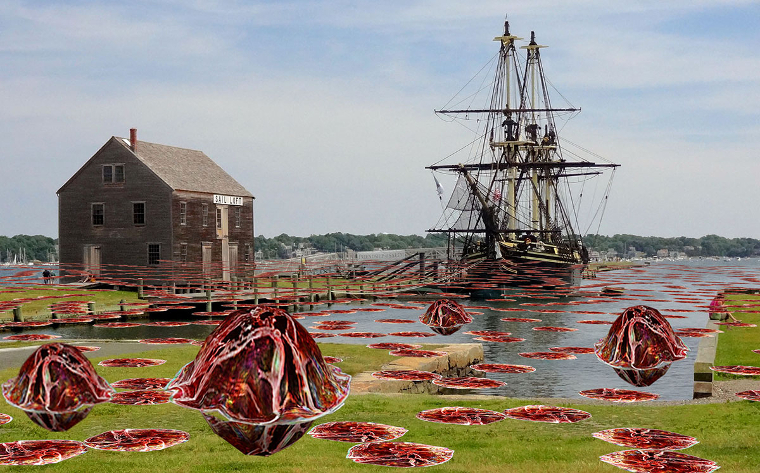 In Tamiko Thiel’s Gardens of the Anthropocene, giant mutant red algea invade Salem Harbor–the algae are virtual, but the danger of climate change provoking more frequent toxic blooms is real. 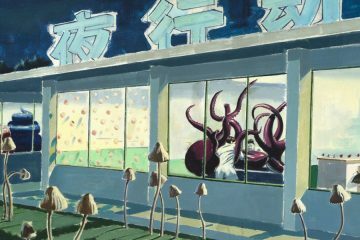 Her Treasures of Seh-Rem transforms the waterfront greenspace into a surreal fever dream of odd, previously treasured wares under the watchful eyes and hairy visages of Yankee traders, as depicted by Japanese artists on first contact with the West. 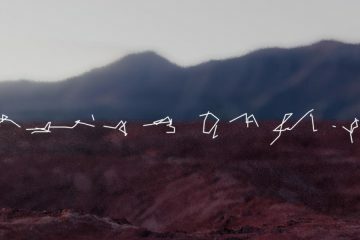 The Augmented Landscape is supported by the National Endowment for the Arts, PTC, Eastern National, Essex National Heritage Area, Salem Cultural Council, and the Massachusetts Cultural Council. 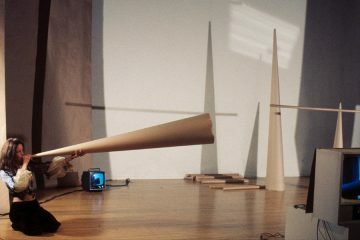 Boston Cyberarts supports and encourages experimentation in the arts through exhibitions, events, educational programs and collaboration with like-minded groups in an effort to foster the development of new practices in contemporary art making. The Boston Cyberarts Gallery is located in the Green Street station on the MBTA’s Orange line in Jamaica Plain. The gallery is the only art space located in a train station in the country, and also the only independent art organization in Massachusetts focusing on new and experimental media. Boston Cyberarts runs two public art projects in downtown Boston; Art on the Marquee at the BCEC, and the art on the LED screens on the Harbor Island Welcome Pavilion located in Boston’s Greenway Conservancy and run by the National Park Service and the Harbor Island Now.